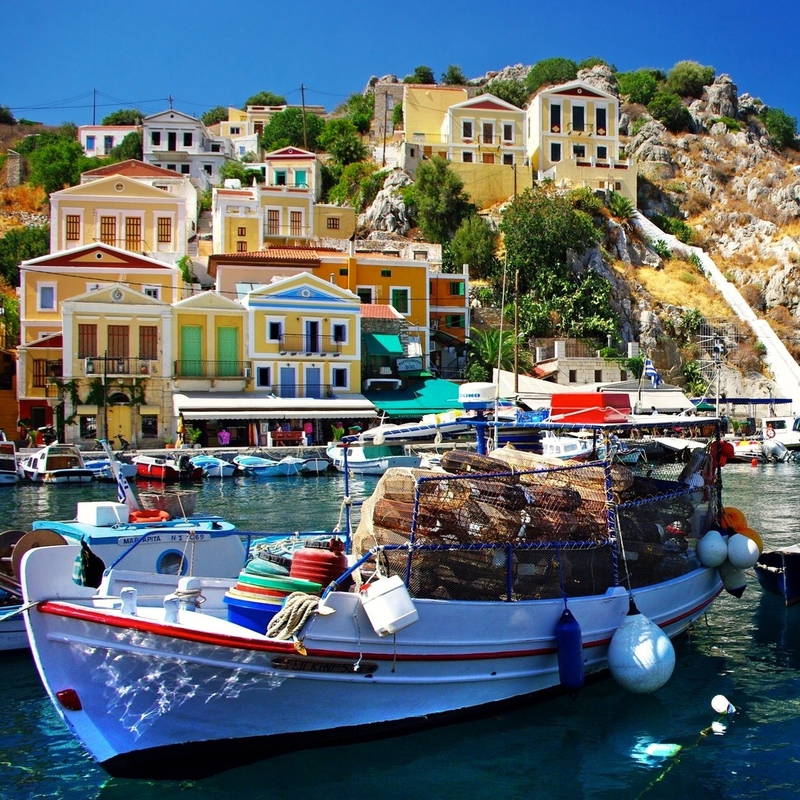 This sailing trip from Kos goes south to Nysiros, Tilos, Chalki and Symi. Welcome aboard! As soon as you are on board you meet your fellow sailors and the crew. We distribute the huts and give you first explanations about the ins and outs on board. Then you can explore Kos town. Day 2: </ strong> From Kos we sail the first day under the mainland of Turkey along the westernmost point of Turkey, Cape Knidos, to the picturesque harbor of Palamut. Here we eat at Adamik. If the wind is favorable, we might even go a bit further and moor in Mesudiye. We eat here at Ogun’s place and do our best to the many Turkish snacks called mezzes. Day 3: </ strong> We head for Simi. Simi has one of the most beautiful ports in the Mediterranean. The old town, completely rebuilt in Venetian style, and can be found on the list of world heritage sites. Simi is a lively town with a buzzling nightlife. It is also called the “Saint Tropez” of Greece. Day 4: </ strong> Today we have long day ahead of us. Chalki is located northwest of Rhodes. It is the smallest inhabited island of Greece. Here too, the influence of the old Venetian style is still clearly visible. Chalki has a pleasant boulevard with many terraces. Day 5: </ strong> On the program today is a tough sailing trip to Tilos. But the effort is rewarded! After this sailing day we sail into the bay of Livadia. We get a spot on the ferry pier if we promise to leave early tomorrow morning. After dinner we can decide to dance the night away. High on the mountain is the deserted village of Mikro Chorio, which has been transformed into a large open air disco. The facades of the village are lit from the back, and with the sparkling starry sky above you and a nice cocktail in hand, you can dance the night away. Day 6: </ strong> Today we sail to Nisyros. We moor in the little port of Pali. We hope to arrive around 4 pm so that we have time to explore the volcano. We get there with a van or rental cars. Once on the crater rim, the view is breathtaking. Here and there hissing sulfur gases from the rock crevices come out and in one of the villages there is a natural sauna where the hot gases seem to come through the rock walls. Day 7: </ strong> The last sailing day takes us back to our home port on Kos. Along the way we make a swim stop at the Therma, the hot springs on the south side of Kos and then arrive at our marina around 4 pm. Day 8: </ strong> Also the end of our sailing trip, and outside of your bronzed color, you also take a suitcase full of beautiful memories home with you. Number of participants: minimum 5 people, maximum 8 people. The routes offer a wide variety of harbors, bays and beautiful views. The routes described are subject to change and can be adjusted by weather and other circumstances. This always at the discretion of the skipper. Welcome aboard! As soon as you are on board you meet your fellow sailors and the crew. We distribute the huts and give you first explanations about the ins and outs on board. Then you can explore Kos town. From Kos we sail the first day under the mainland of Turkey along the westernmost point of Turkey, Cape Knidos, to the picturesque harbor of Palamut. Here we eat at Adamik. If the wind is favorable, we might even go a bit further and moor in Mesudiye. We eat here at Ogun’s place and do our best to the many Turkish snacks called mezzes. Day 3: We head for Simi. Simi has one of the most beautiful ports in the Mediterranean. The old town, completely rebuilt in Venetian style, and can be found on the list of world heritage sites. Simi is a lively town with a buzzling nightlife. It is also called the “Saint Tropez” of Greece. Today we have long day ahead of us. Chalki is located northwest of Rhodes. It is the smallest inhabited island of Greece. Here too, the influence of the old Venetian style is still clearly visible. Chalki has a pleasant boulevard with many terraces. On the program today is a tough sailing trip to Tilos. But the effort is rewarded! After this sailing day we sail into the bay of Livadia. We get a spot on the ferry pier if we promise to leave early tomorrow morning. After dinner we can decide to dance the night away. High on the mountain is the deserted village of Mikro Chorio, which has been transformed into a large open air disco. The facades of the village are lit from the back, and with the sparkling starry sky above you and a nice cocktail in hand, you can dance the night away. Today we sail to Nisyros. We moor in the little port of Pali. We hope to arrive around 4 pm so that we have time to explore the volcano. We get there with a van or rental cars. Once on the crater rim, the view is breathtaking. Here and there hissing sulfur gases from the rock crevices come out and in one of the villages there is a natural sauna where the hot gases seem to come through the rock walls. The last sailing day takes us back to our home port on Kos. Along the way we make a swim stop at the Therma, the hot springs on the south side of Kos and then arrive at our marina around 4 pm. This the end of our sailing trip, and outside of your bronzed color, you also take a suitcase full of beautiful memories home with you. Number of participants: minimum 5 people, maximum 8 people. The routes offer a wide variety of harbors, bays and beautiful views. The routes described are subject to change and can be adjusted by weather and other circumstances. This always at the discretion of the skipper.